PORTSMOUTH – The New Hampshire Art Association will be holding a “Body of Work: Series IV” exhibition during the month of September at the Robert Lincoln Levy Gallery on State Street. NHAA holds several “Body of Work” shows throughout the year to give its members an opportunity to show a grouping of their works as opposed to having one piece getting lost hanging among many other artists’ works. Artists are chosen by a lottery for each of these series. Artists included in this BOW show include Joe Flaherty, Shawn Pelech, Sandra Kavanaugh, Jane Davis Copp, Barbara Stevens Adams, Barbara Barclay, Kathy Ostrander-Roberts, Judith McKenna and Alan Shulman. Here is a snapshot of four of the exhibiting artists. “In this series of paintings, I continue to explore the relationship between color and shape, but I’ve tried suggesting a narrative in each painting by placing it in an imaginary setting—a landscape of the mind’s eye,” Flaherty said. Shulman said both country and city find expression in his work. Cities are embedded in his consciousness having grown up in New York City and Chicago and spending more than 40 years in Boston. “And since I have lived the last 21 years with a clear view of Mount Sunapee, nature in all its beauty and mystery is also an indelible part of me, and with particular concern for its degradation,” Shulman added. Adams’ involvement with art began in 1987 at creative arts workshop in New Haven, Connecticut. She moved to New Hampshire in 1990 and pursued her art studies in Portsmouth. The ensuing process has taken her to her current passion with pastels and oils. 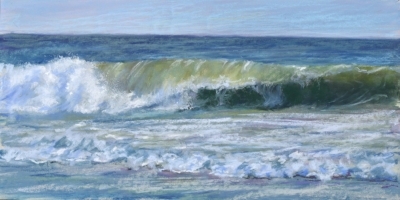 The focus of Adams’ art is frequently themes from her “en plein air” painting excursions, her international travels, and her enjoyment of the history and many moods of the New England Coast and U.S. Virgin Islands. The title of Kavanaugh’s body of work is "Sea Fever" from the poem by John Masefield. “The beauty of New England continues to inspire me but I am particularly drawn to the ever changing coast,” Kavanaugh said. When: Sept. 5 to Sept. 30. Opening reception, Friday, Sept. 7, from 5 to 8 p.m.
Gallery hours: Tuesdays, Wednesdays and Thursdays from 11 a.m. to 5 p.m.; Fridays and Saturdays, 11 a.m. to 8 p.m.; and Sundays from 12 to 5 p.m.
Press Release for the Main & Gerry Frazier Galleries in July 2018.